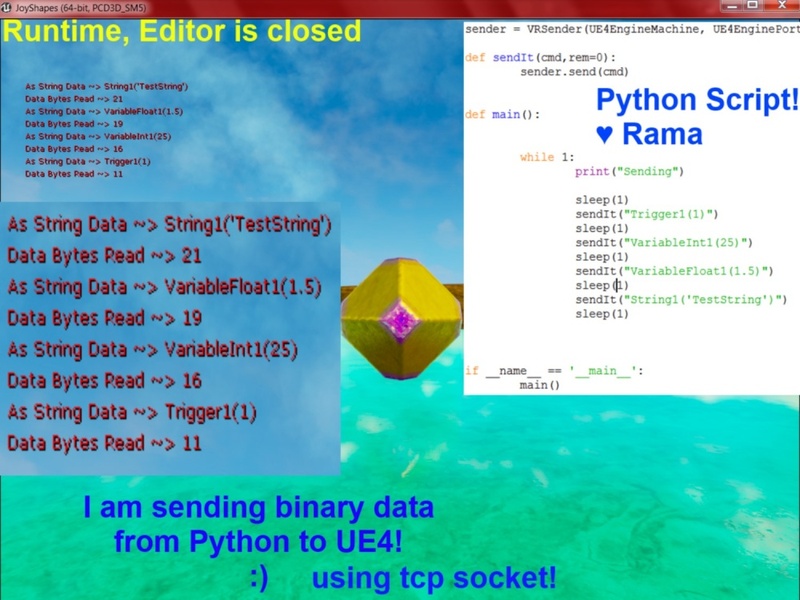 In this tutorial I am giving you the code I used to enable a python script to communicate with UE4 over a TCP socket! I am just straight up giving you my whole source code that I spent the past several hours writing! "This module is an internal R&D effort to explore how the socket subsystem could be improved. Production use is NOT encouraged at this point." For the reader of this tutorial this means the module will likely perpetually change as development on the UE4 is progressing. For example, since the initial writing of this wiki tutorial the FTcpListener class has been added which makes a lot of Rama's delightful work redundant. However, in the future this class may again be changed or removed entirely. The flow goes basically from the top down, you can probably guess the purpose of this first function. //UE_LOG  "TCP Socket Listener Created!" //UE_LOG  "TCP Socket Listener Created! Yay!" BinaryArray.Add(0); // Add 0 termination. Even if the string is already 0-terminated, it doesn't change the results. // Create a string from a byte array. The string is expected to be 0 terminated (i.e. a byte set to 0). // Use UTF8_TO_TCHAR if needed. // If you happen to know the data is UTF-16 (USC2) formatted, you do not need any conversion to begin with. // Otherwise you might have to write your own conversion algorithm to convert between multilingual UTF-16 planes. The first socket listens on the port and IP supplied, and if a connection is received on this port, then the actual ListenerSocket is created. The ListenerSocket is run in very short looping timer of 0.01 seconds. Whenever the ListenerSocket receives data, it makes sure to gather all of it using the while loop, and then I convert the results into a FString. Community Member alfalfasprossen has been developing a communication interface between UE4 and Maya since 2014 using TCP sockets. Check out his code and see if you can learn some more! Here is another implementation you can check out from a UE4 Community member! I am sharing my last several hours of research with you in fully functional C++ code format!